Recently the pupils of “Armath” engineering club-laboratory of basic school N5 after Mkrtich Martirosyan in Ijevan hosted the famous IT education project representatives from Ucom and Union of the Information Technology Enterprises (UITE). The twenty-six pupils, who acquire engineering and programming skills in this laboratory, are mainly 6th-7th grade pupils, who try to apply their knowledge of algebra, geometry and physics. It’s noteworthy that one of the components of 3D printer of the laboratory have broken down and the students of this laboratory have been trying not only to design that component by using a computer, but also print the damaged component all by themselves. «I wish to become a programmer, in order to develop the programming industry in Armenia. 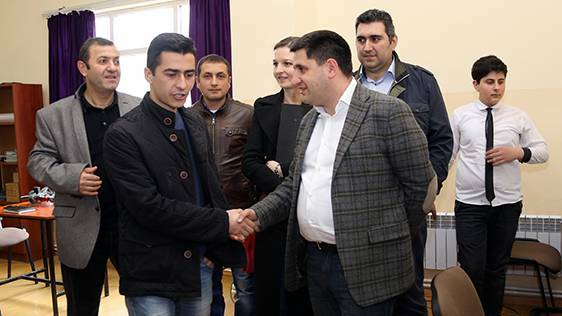 Moreover, I also wish to become an engineer and design equipment of the future on my own, one of which may be, for example, a coal mining robot to facilitate hard physical work», - says Garik Amiryan, a student of “Armath” engineering laboratory of basic school N5 after Mkrtich Martirosyan in Ijevan. «I’m learning to work with «Scratch» and «K-Turtle» programs, in order to become an engineer or a programmer in future. Thanks to the knowledge acquired in this laboratory, I’ll be able to design a “smart door”, which will send a message to the adults of the family upon arrival of guests, as well as will enable to establish video contact with guests and speak to them. If, for example, a child or any familiar person approaches the door, it would enable the ones in the house to open the door distantly», - dreams Ruben Sahakyan, a student of the same laboratory. «We emphasize the importance of interest in modern technologies of children living in regions. In “Armath” laboratories they acquire practical skills and knowledge with the help of which they can create, for example, objects working on the basis of artificial intelligence. What we see today is quite satisfying: children’s imagination is boundless and the future is encouraging», - said Hayk Yesayan, director general at «Ucom». The students of this laboratory have also participated in DigiCode contest with a game entitled “Pythagoras”, designed by them. By the way, Tigran Safaryan, Marketing and Communications Director at Ucom, spoke on the importance of “Armath” laboratories, opened with the support of Ucom, during the 2-day WCFDavos/Yerevan Forum, by noting that “Armath” laboratories have been in the center of attention of Ucom during the last 3-4 years, such laboratories have been opened in around 200 schools, including in border settlements, and they aim to serve as a kind of forge for future employees of the company.